Soft Cover Historical guide well supported by B&W photos, Colour plates and tabular information in 96 pages. A superb collection of photos and colour plates of the weaponry used by nationalist Forces during the Spanish Civil War. The subject of Spanish Civil War is an interesting one and one which receives little coverage in mainstream English language publishing. 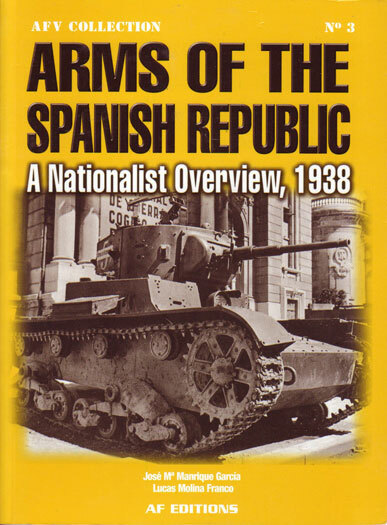 This book is an interesting title and provides a fascinating catalogue of the vast array of weaponry used by Spanish nationalist forces during Spain’s bitter Civil War. The book is basically a catalogue of a vast exhibition of captured equipment which was held in 1938 and has been compiled from the original catalogues with added colour plates of some equipments. The chapters are adorned with excellent quality photos and are backed up by lovely colour plates of the most significant pieces. The text is basically a listing of the equipment in the exhibition, while the tables offer catalogue numbers and descriptions. I found this to be an interesting book but I must warn prospective readers this is not a history or walk around book but a catalogue of a vast collection of equipment. If you have ever picked up a museum catalogue you should have good idea. The colour plates of some of the more unusual equipment such as the Catalonian Armoured Cars really set this apart from a simple catalogue, and the numerous photos add to the experience. If you are a modeller looking for an unusual subject, then this is a good starting point.